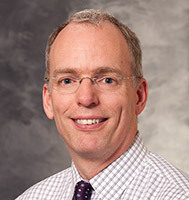 Dr. J. Carter Ralphe is the chief of the Division of Pediatric Cardiology within the UW School of Medicine and Public Health and co-director of UW Health's Pediatric Heart Program. He is board certified in pediatric cardiology. Dr. Ralphe and Chief Pediatric Cardiothoracic Surgeon Petros Anagnostopoulos, MD, lead the comprehensive Pediatric Heart Program at American Family Children's Hospital. Dr. Ralphe’s clinical interests include diagnosis and treatment of congenital heart defects, acquired and familial forms of cardiomyopathy and pediatric heart failure. Dr. Ralphe's research interests include genetic forms of cardiomyopathy and the development of stem cell models to study human heart disease.